Defend-X® Industrial Coatings are the first line of defense in the protection of facilities, equipment and vehicles from impact, abrasion, corrosion, and chemical attack. DefenseTech International, Inc. offers a product line of versatile high performance, proprietary formulated polymer products that can be utilized in a wide range of applications across multiple industries. The outstanding physical, chemical and environmental properties of Defend-X™ make it the natural choice of professionals looking for the best products on the market. Defend-X® high performance polyurethane products provide the ultimate protection for buildings, equipment and vehicles from wear and tear, abuse and the elements. 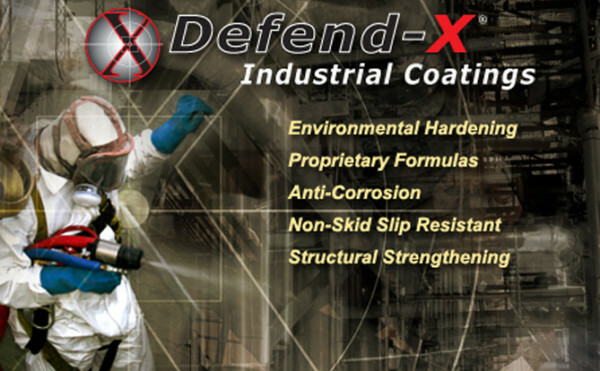 Defend-X™ Industrial Coatings are designed and tested under the most extreme conditions to protect assets from impact, abrasion, corrosion, and chemical attack. Linings for thermal, rehabilitation and blast protection of tank farms, pipelines, secondary containment, tank roofs, non-skid and corrosion control of floors, walkways, helicopter pads, workshops, control rooms etc. Linings for blast, ballistic mitigation, non-skid and corrosion control of all types of transport trucks, helicopters, buses, trains, boats, ships, freighters, first response containers, law enforcement vehicles, fire and ambulance vehicles, etc. Protective linings for blast, ballistic, rehab, hazardous building material encapsulation and corrosion control of US Embassies, NATO buildings, banks, offices, federal buildings, mechanical rooms, sewage treatment tanks and pipes, grain silos, food treatment plants, floors, parking garages etc. Defend-X® can be applied with excellent adhesion to concrete, wood, steel, fiberglass and some plastics. Our products can be installed or custom spray-cast to any desired shape and thickness from 1/8 inch to multiple inches thick. Defend-X® is tack-free within 40 seconds of installation, saving you money by reducing the amount of downtime required for installation. Defend-X® Industrial Coatings are VOC free with emissions well below the National Institute for Occupational Safety and Health’s standards after one-day post application. With adequate ventilation, the compound’s emissions are well below the National Institute for Occupational Safety and Health’s standards after one-day post application. Within one-week post application, most of the compound’s emissions were undetectable. Contact Us and see how Defend-X® Industrial Coatings can enhance the protection of your critical equipment in your organization.